The Hepsia web hosting Control Panel offers a fully featured database management graphical user interface, which will give you full authority over your databases. 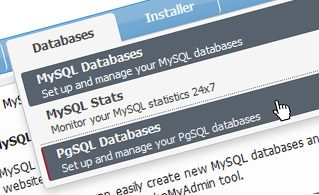 You can easily set up brand new MySQL and PostgreSQL databases and administer their settings through the phpMyAdmin and phpPgAdmin database administration tools respectively. With the Database Manager, you can create a new database in no time - simply specify its name and that's it. You will notice a list of all your databases and their respective sizes. You will be able to modify passwords, to create database backups and to even log into the phpMyAdmin and phpPgAdmin software tools. It is quite essential to create routine backups of your DBs to protect your web site content and to avoid any unexpected loss of data. 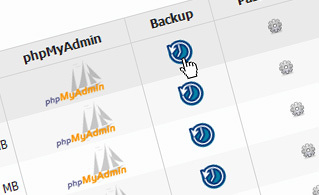 With the Database Manager interface, creating a database backup is extremely easy. Simply press the Backup button next to the database you want to back up and you will be immediately taken to the File Manager from where you can download your freshly created backup file. The number of PostgreSQL and/or MySQL DBs that you can set up varies based on the web hosting package that you have picked. While MySQL is a very famous database management system utilized by millions of users all over the world, PostgreSQL is looked upon as being a more innovative database management system and is primarily used by technically capable website administrators. 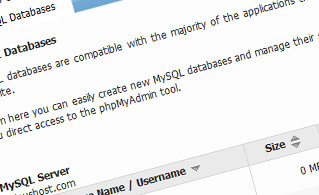 You can administer your MySQL databases through the phpMyAdmin tool, while PostgreSQL DBs can be managed via the phpPgAdmin software tool. 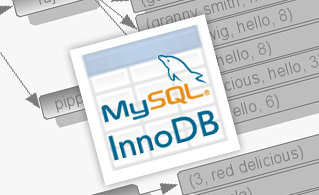 InnoDB is the leading transactional storage engine for the MySQL database management system, which is aimed at protecting user data and at enhancing multi-user concurrency and performance. When you would like to create a new DB table, simply log in to the Hepsia Control Panel-incorporated phpMyAdmin database management tool and choose the InnoDB database engine from the list of available database engines. Hepsia's Database Manager also includes detailed stats about your databases, including the number of hourly database requests. This will give you a clue about how much load is generated during a particular time period. Copyright © 04 Host 2004 - 2019. All Rights Reserved!